* How and why does a school develop a shared vision of what it stands for? * What makes a great teacher, and how can a principal help good teachers improve? * Why must schools talk openly about race and achievement, and what happens when they do? 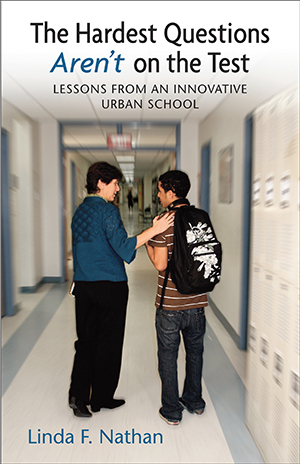 With engaging honesty, Nathan gives readers a ring-side seat as faculty, parents, and the students themselves grapple with these questions, attempt to implement solutions, and evaluate the outcomes. Stories that are inspirational as well as heartbreaking reveal the missteps and failures-as well as the successes. Nathan doesn't claim to have all the answers, but seeks to share her insights on schools that matter, teachers who inspire, and students who achieve. The Boston Arts Academy’s mission is to be a “laboratory and a beacon for artistic and academic innovation,” and as such we regularly have teachers and educational leaders coming to learn about our curriculum, programs, and structures. We are an eleven-year-old pilot school that operates within the Boston Public School district, but we have considerable freedom to create our own curriculum. We also have the ability (unlike most public or charter schools) to select our students through an audition process. We do not look at prospective students’ academic records (we call this an academic-blind application process), but we do screen them for passion and commitment to pursuing their chosen art form (music, dance, theater, or visual arts) seriously. Approximately 400 students audition each year for about 140 seats. We can accept only students who live in the city of Boston. Our school is small (420), and our diversity mirrors that of our district, Boston Public Schools (our students are 48 percent African American, 30 percent Latino, 17 percent white, 3 percent Asian, and less than 3 percent Native American and other). In terms of socioeconomics, BAA has approximately 60 percent of its students on free or reduced lunch; the district is at 71 percent: we have definitely attracted more middle-class students to our school. In terms of special education, 13 percent of our students have identified special needs, compared to a district rate of 20 percent. We also have a small number of students identified as English language learners (under 6 percent), whereas the district has a larger number (18 percent) since many schools have what is now called Sheltered English Language programs, formerly known as bilingual education. Presently, we do not have a bilingual program, though we have a deaf education program. We are very lucky to have a diverse faculty as well. Of our forty-five teachers, 50 percent are teachers of color. The percentage of teachers of color in Massachusetts is just under 10 percent. Over half of our teachers are first generation to attend college themselves; 50 percent speak a language other than English; and 95 percent have advanced degrees, some more than one. We have an active gay, lesbian, bisexual, and questioning community among our students, which is supported by gay and straight staff members. We are proud that 95 percent of our students go on to college, in striking contrast with the average within Boston Public Schools, which is under 50 percent. Our school is housed in an adequate, but by no means luxurious, building in the Fenway area of Boston, which we share with another pilot school, Fenway High School. Because our school is both different from “typical” public high schools and successful by measures that matter to policy makers locally and nationally, we host lots of visitors each year, including teams of teachers and leaders from schools interested in implementing changes. I try hard not to present myself and the staff of BAA as having all the answers, but rather as willing to ask those tough questions. Sometimes I call this “sharing our warts and wounds,” which is another way of saying we try not to whitewash our struggles. But no matter how self-consciously and even humbly we prepare ourselves, I thought, the visitors who have been forced to come are unlikely to learn much from us. To my surprise, though, a group of visitors we had come by the school last month had been impressed listening to our students, very much like their own, describe their struggles and triumphs in the classroom. One student talked about being homeless and how BAA’s Student Support team found her housing and part-time employment so she could be more financially independent while continuing at school. She had passed all but one of her classes that semester. The visitors had nodded sadly at her story. Each one of them knew students in similar or worse situations. A group of BAA’s native Spanish speakers talked about a project in Spanish class: to write an original story and then go to the local bilingual school to read those stories aloud to younger bilingual students. Their teacher explained that for many of her students, who previously had not been doing very well in school, completing a project in their home language allowed them to see how their academic work connected to their lives and to their communities. “My students loved feeling so important to those second-graders! Some were even asked for their autograph like they were published authors. And every single one of my students finished on time, and did the assignment very well.” The visitors’ eyes lit up. “Yes, this is an activity that we could do, too,” they seemed to say. But as BAA teachers and students talked about whole-school initiatives--such as when we all visit colleges, or school-wide community days or assemblies, or weekly professional development seminars, or the integration of arts and academics, or our portfolio assessment system, or the role of parent and student leadership, or even our advisory system--the visitors were quiet, almost aloof. Those endeavors, I thought, seemed much too overwhelming. Individual classroom efforts were possible, but not a whole-school enterprise in which everyone participated. Enough thinking about last month’s visit, I had to get ready for today’s, if, indeed, it was going to happen at all. 1 What Does This School Really Stand For? How to move from endless initiatives to a unifying framework? 2 What Happens When Schools Develop Shared Values? What can school leaders do when those values are challenged? What makes great teachers possible, and how much can school leaders really ask of them? What are the risks and rewards of transforming a faculty into a professional learning community? 5 How Do We Talk about Race?